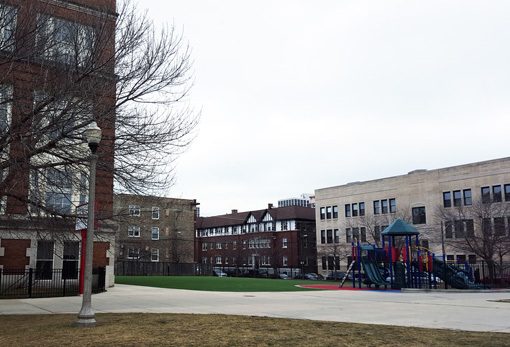 "Today, CPS has officially sold Graeme Stewart School at 4525 N. Kenmore to Morningside USA. Their bid was the highest of a total of 4 bids and their plans complemented Metropolitan Planning Commission's report based on community feedback. Click here to view a copy of that document. This development will be in 3 different phases, with the first phase focused on the rehab of the school itself into 50 residential units. Second and third phases will rely on zoning changes that will require further community feedback from residents and the 46th Ward Zoning & Development Committee. The architectural firm Pappageorge Haymes Partners is doing this project. You will see some immediate changes to the property. 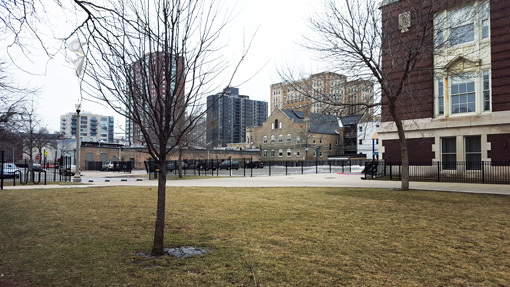 For liability reasons, Morningside USA will fence the entire perimeter of the property, close the parking lot just north of the property, and remove the existing playground equipment. Morningside has donated this equipment to Kids Around The World for reuse because neither the Chicago Park District nor CPS are able to take the equipment once it has been removed. This particular area is going through a lot of construction with the Wilson L and two other transit-oriented developments within a few blocks of one another, which can be very inconvenient. However, I am hopeful that the lasting benefits to our community will far outweigh the temporary inconveniences. As always, please contact my office if you have any questions about this or any projects in our ward." 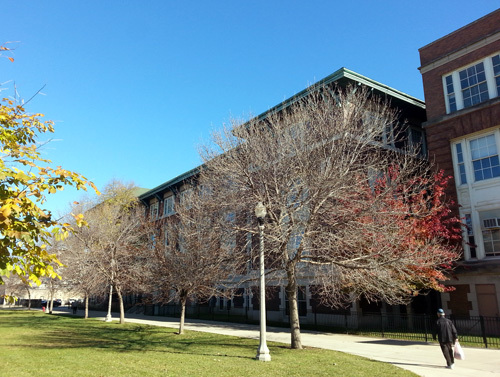 The north section of the campus, currently a parking lot with an entrance off the 4500 block of Kenmore, once used by school staff. Behind Uptown Pizza & Ribs. Wonderful step forward. Can't wait to see a nice restaurant and high end homes in here. Sign on the parking lot north of school saying ownership has changed and no parking or entry allowed as of January 28th......today. Only one car in lot as I walked by earlier today. I was heading over to Target to get some Charleston Chews. Front of store as you walk in. Only $1 per chew. Life is good! I look forward to this development moving forward...forwardly in a forward motion. Nothing says forward movement more eloquently than a youtube vid of bagpipers playing "The Lion Sleeps Tonight". Ack. I messed up the link. Too much dancing and cavorting in the Stewart School parking lot for me.